A frequently asked question about DLPAL LS is about the cluster choice. 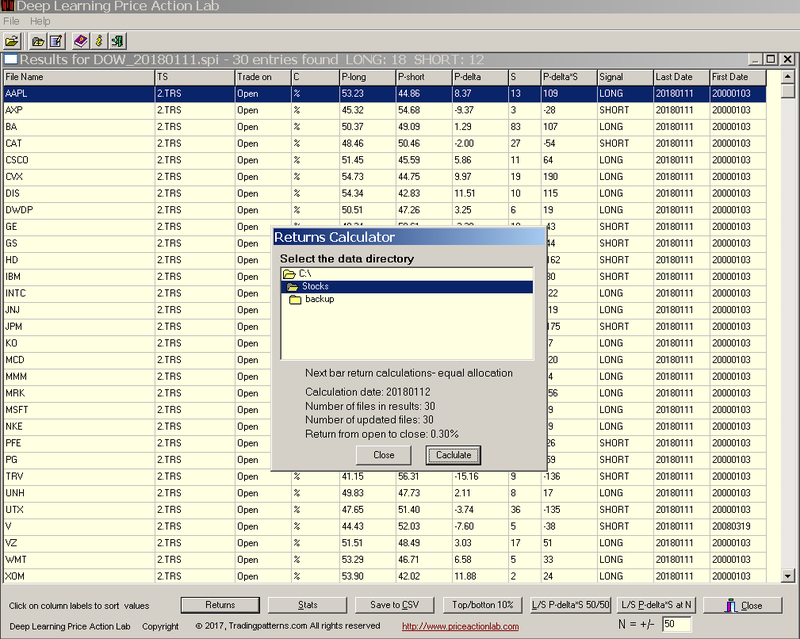 Below is an example of how cluster choice can affect daily results. 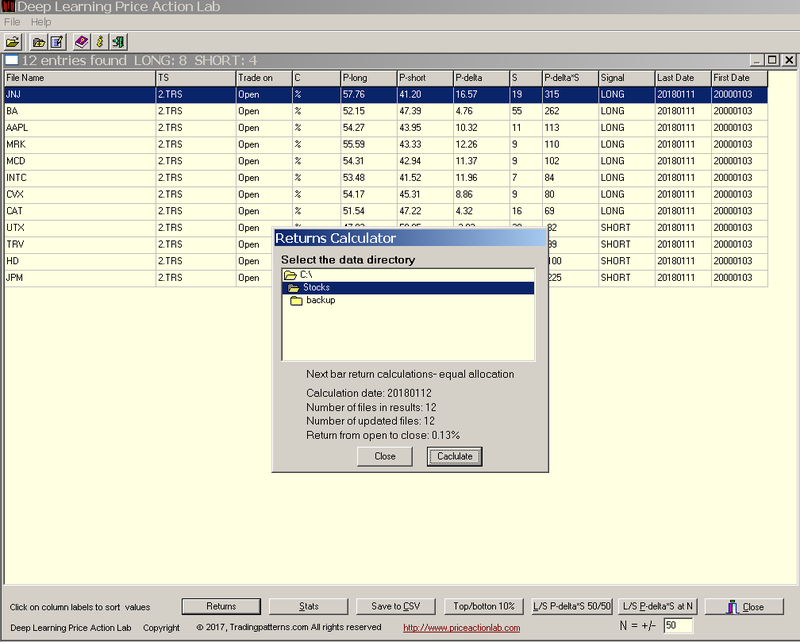 For a more detailed evaluation of the four different clusters used to generate results in DLPAL LS see this article. Below are the DLPAL results for DOW 30 stocks with data since 01/03/2000, as of the close of last Thursday, January 11, 2018. The long/short selection is based on a score equal to the product of P-delta and significance S being greater than 50. The conservative cluster results are shown below. TS is the profit-target and stop-loss file, P-long and P-short are the long and short probabilities for a position in the corresponding ticker, P-delta is the difference (P-long – P-short), a measure of the directional bias and S is the significance of the result (for weekly data 0 means low or no significance. The average return of all stocks, long and short, from the open to the close of Friday, the next day after the results were generated, was 0.29%. Below are the results after using the normal cluster. The average return in this case from the open to the close of Friday was 0.13%. The conservative cluster generated more than double the return of the normal cluster in this particular case. In general, the new conservative cluster seems to behave better, especially under low volatility conditions with a positive directional bias but there are exceptions to this. We have a user who trades a portfolio of large cap stocks and takes into account the results from both clusters for averaging performance. 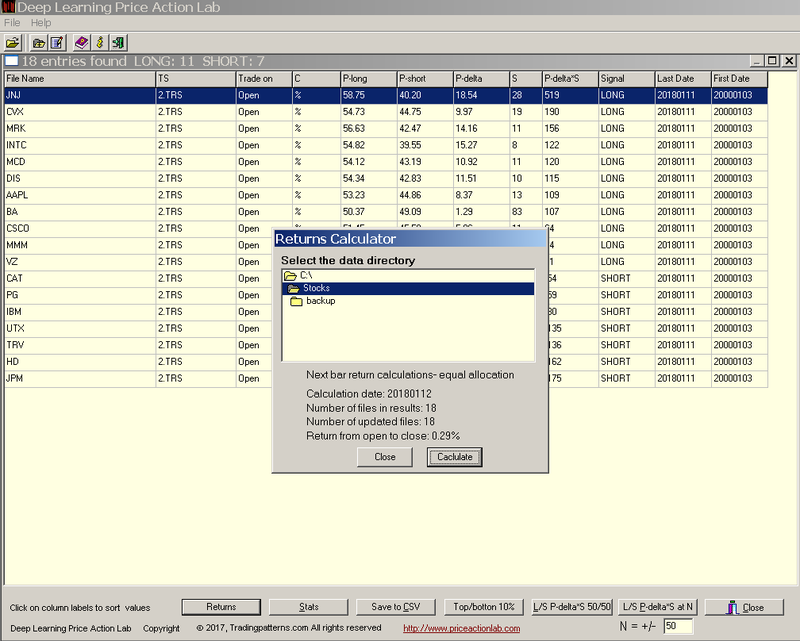 Therefore, the conservative cluster after the scoring generated nearly the same result as before the scoring but with only 18 instead of 30 stocks. This is the desired behavior to result in lower transaction cost.